If you've just come the amazing Carissa Wiley's blog, then you're in the right place! Also, I never thought I would say that sentence. But let's not dwell on the surreal feeling of that. Thanks for joining in the fun to celebrate Heffy Doodle's Release 3! I was just dying a little inside with cuteness overload when I saw the sketches for this release a long time ago. Today I've got this colorful leprechaun card for your enjoyment. I never really thought of leprechauns and St. Patrick's Day as being great inspiration for cute cards, but these are totally adorable! I started off by stamping the images from the Lucky Friends stamp set on to white cardstock. I colored the images with copic markers, used the matching dies and then set them aside. Leprechauns immediately make me think of pots of gold, which then immediately make me think of RAINBOWS--how about you?! Because I knew I wanted to incorporate a rainbow into this card, I was searching for a creative way to do that. Enter the Stitched Strips of Ease dies! They make PERFECT rainbow strips! I colored the stitched strips of ease with my copic markers and then glued them to my card base. After I had my diagonal rainbow going on, I mounted my leprechaun images on to some foam tape and then placed them on my card base so that it looked like the leprechaun was sitting on top of the rainbow with all his gold next to him! I finished off the card by stamping my sentiment on to the card base in black ink. I noticed that my leprechaun looked a little flat, so I added some details to his hat and his socks with a white gel pen. Ok, I know you guys just skimmed this post to get to the good stuff, so I won't keep you in suspense any longer. How would you like to win PRIZES?! Hop along to the other blogs listed below. 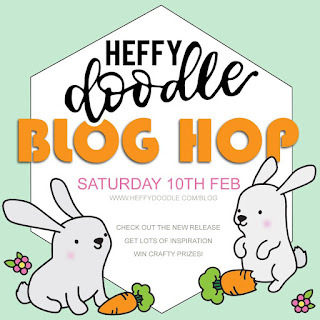 A random winner will be selected for a £25 gift certificate and free shipping to the Heffy Doodle store. To be eligible, leave comments across the entire blog hop by 11:59 PM PST on 2/15/2018. 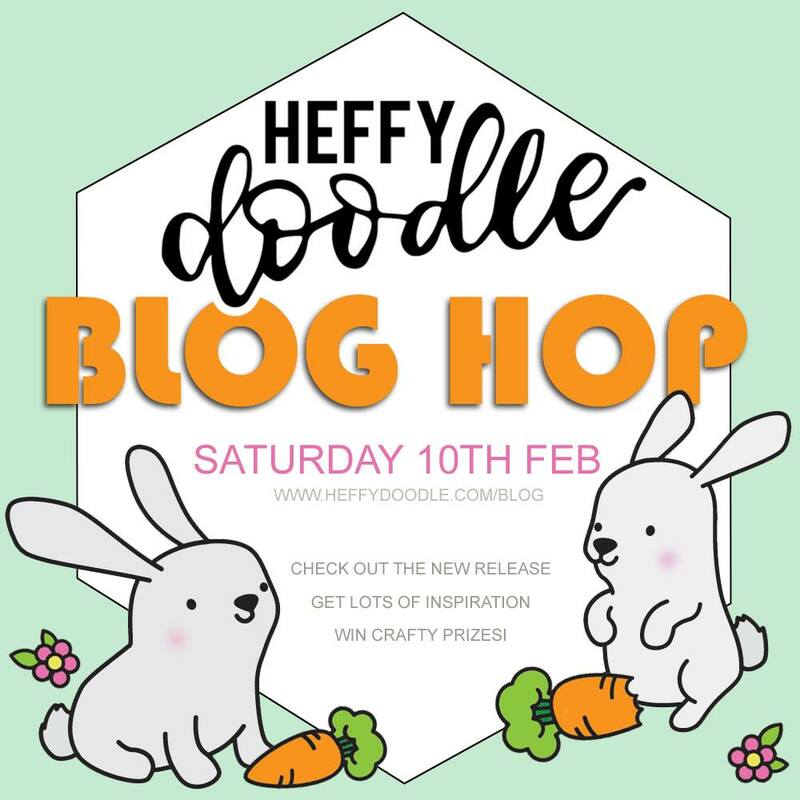 Winners will be announced on the Heffy Doodle Blog. We are grateful for your kind comments and support of Heffy Doodle! Thanks again for stopping by and thanks for celebrating Release 3 with us! Have a Heffy Doodle Day! 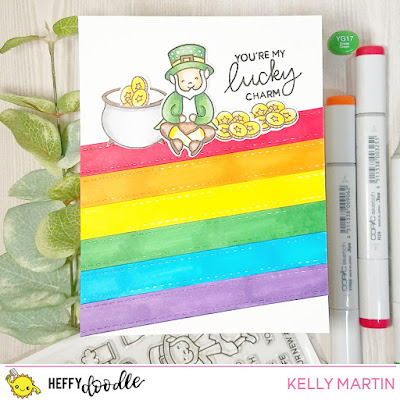 A leprechaun on a rainbow - what an inspired and great card. I love it. Loving his cute little face, great way to create a rainbow that's not just the typical arch, I love your card, thanks for sharing. So fun, love the rainbow goodness! What a cool way to do a rainbow for this wee fellow! Really cool rainbow effect! I love the little leprechaun sitting on top with his gold! Love your idea of incorporating a rainbow in the card! So cute! Great design! Fun card! Love the rainbow and the cute leprechaun! Nice and colorful. Love your details. Anyone would be “lucky” to receive your cute card! Great idea to sit this happy fellow on his own rainbow! Lesley has made some fun ones for us again! Very fun rainbow card and I love how you put the leprechaun sitting on the rainbow. Love St. Pat sitting on the rainbow. Glad to see he's getting his due. So cute! I love how he's sitting on the rainbow stripes. So cute and perfect with the rainbow of colors. Beautiful card. Those die strips are perfect for rainbows 🌈!! I never thought of this. Love how you did the rainbow. Those stitched strips are quickly becoming a need! Really cute card. Love love love the rainbow. Very colorful card and a cute stamp set. So colorful and fun! That leprechaun is so cute! This is such a cute card !! Such a fun card! I love the rainbow stripes you added to the card! Yes, every leprechaun and pot of gold needs a rainbow!